Answer the call to brawl and decide the fate of the universe! 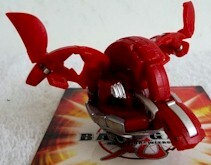 Iron Dragonoid is a Bakugan and is one of Dragonoid's variations. It is most likely a Heavy Metal Special Attack Bakugan. It might be used in Season 4. Purchase your Iron Dragonoid from Amazon now!